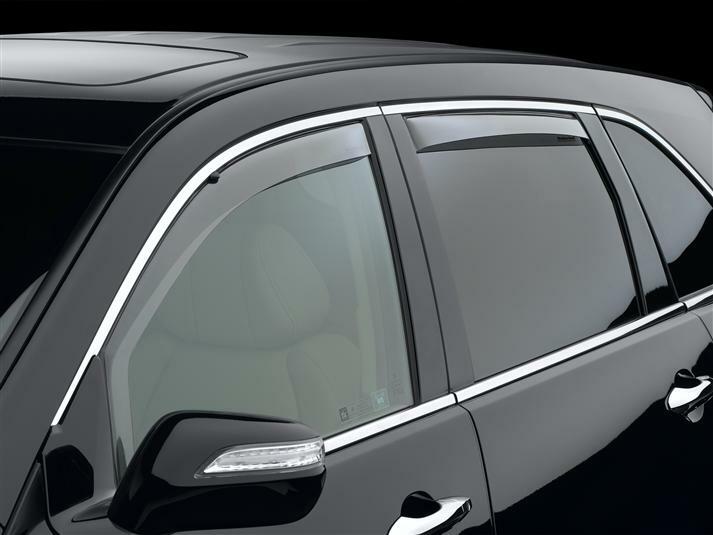 The WeatherTech Side Window Deflectors offer numerous benefits for your car. First, they prevent rain and light moisture from entering your interior even if you drive with the windows open. They also help keep your side windows dry in the rain, improving overall visibility. But they also allow heat to escape faster when you park your car under the sun. They also reduce wind noise, especially in high-speed highway driving. Made from 3mm acrylic material, the WeatherTech Side Window Deflectors are the only deflectors in the world made with a D.O.T. (U.S. Department of Transportation) approved glazing material that provides a luxurious feel and unparalleled durability. WeatherTech Side Window Deflectors are also easy to install, and does NOT require drilling or using unsightly adhesive tape. It slides effortlessly inside the window channel so it is easy to remove as well. Available in light and dark tint configuration. Optically transparent acrylic material that does not impede visibility. OEM quality, providing durability and a sleeker look. Sleek aerodynamic styling reduces wind noise while driving. Installs in minutes without drilling or ghastly adhesive tapes. WeatherTech Side Window Deflectors are available at Sam’s Motorsports for a wide array of cars, trucks and SUVs. 2008-2011 Acura MDX WeatherTech Side Window Deflectors, The WeatherTech Side Window Deflectors is designed specifically to fit your 2008-2011 Acura MDX without any modification to your beloved Acura MDX. If this WeatherTech Side Window Deflectors is not exactly what you are looking for to accessories your 2008-2011 Acura MDX, please don't give up just yet. Our catalog has huge variety of parts and accessories for your Acura MDX.